Cities sometimes have a geographical feature which is part of their international image and also integral to their history. What makes these geographical features all the more significant is that they have been there long before the city existed. This lends a certain innate credibility to their appeal, since they are not man-made and are far more impressive and extensive than anything an architect is able to produce. Because no person constructed them, and because they do not resemble anyone, they are politically neutral, and are therefore not involved in passing ideologies or transient economic systems, which makes them perfect for the long-term marketing and image-building of an international destination, since their value to the brand is not dependent on who is in government or which flag is flying in the city. As an example, Venice is a city of water, with many canals and boats where other cities of the world have paved roads and cars. Anyone who has been to Venice or even read about it can probably tell you that the city has water where others have asphalt. So in determining the most characteristic landmark of the city of Cape Town in South Africa the obvious choice is also a natural one – Table Mountain. Perhaps the first thing that catches the eye on cruising in to land at Cape Town International Airport is the range of mountains that borders the city center. Badges and emblems associated with Cape Town typically include or consist of an outline of the famous mountain. It most striking visual characteristic, namely that it is flat-topped, is immediately obvious when viewed in profile from the ground. 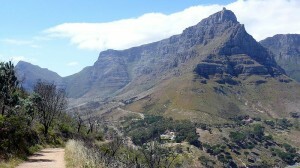 Standing at about 1km (3000ft) in altitude, Table Mountain is not merely a hill or a mound and it towers over the city, providing a dramatic backdrop of rugged gray stone to the sedate, ordered urban landscape below. South Africa is a country renowned for its natural beauty and even in the heart of a major urban center such as Cape Town one is reminded that there is an extent to which nature has never been tamed or conquered by people. Of course, the mountain poses no threat to the city, since it is not any kind of volcano and it does not release avalanches. It is not high enough to cause difficulties to air traffic, and it is also low enough to allow for easy access to its summit. Cape Town is a sprawling, low-density urban settlement, and the mountain is visible from practically anywhere in the city, as the easiest landmark to navigate by, as it squats on the western horizon in the glowing sunset of late afternoon or turns crimson in the gentle light of early morning. Table Mountain. Note the cable-way station protruding at the right upper extremity of the mountain. For more than 80 years, a cable-way service has been in operation to the top of the mountain. The service has an impeccable safety track record and transports many passengers on a daily basis. For those who prefer some moderate exercise, there are stairs all the way to the top, as well as a hiking trail. If you decide to take on the mountain on foot, you are advised to make use of a guide and only do so during the day. Once you have summited, you may refresh yourself in the restaurant at the top, enjoy the view, and gaze out over Robben Island, where former State President Nelson Mandela was incarcerated for more than 20 years, and wonder what thoughts he may have had as he looked up at the mountain through the bars of his cell. You too may be inspired by the mountain, which has stood unscathed through the centuries of South Africa’s tumultuous and checkered history. A tall mountain without any peaks is somehow similar to a society striving for equality and stability in a globalizing and unstable world.